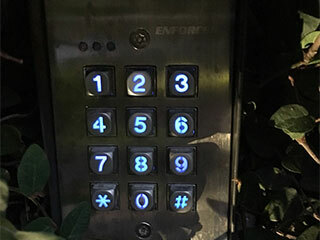 Problems With Your Gate Intercom? Call Us At Gate Repair Ramona! Your driveway gate needs a reliable, secure phone entry system in order to allow you to communicate with visitors. Being able to learn who's waiting outside without having to physically go and see allows you to easily control access, and is also essential for preventing intruders from getting into your property. Our technicians offer a full range of services for installing and repairing your intercom, ensuring that you and your family benefit fully from the safety and security this type of system can bring. A good entry system should perform two basic functions; it should let you identify the person waiting on the other side of the gate, and allow you to let them in remotely. There are many different types of systems available which offer different approaches; some are straightforward phone systems which let you “buzz” visitors in. Others are more sophisticated, and provide video capabilities as well as audio communication. Our team has extensive experience with all the various systems available today, and will give you expert advice on which models are best-suited to your home. Our technicians offer in-depth repair services for intercom systems that stop working, too. As is the case with any electrical system, there are numerous different issues that can crop up; the intercom may fail to allow visitors in, or be unable to provide reliable communications between the driveway gate and your home. These systems are also vulnerable to physical damage, and the unit’s housing can also sustain damage. Our team has more than a decade of experience solving these problems, and can quickly provide a lasting fix for any issue. The intercom system of your automatic gate must function properly on a regular basis, as it is a major security and convenience enhancement. Don’t hesitate to contact Gate Repair Ramona for any related need you may have.